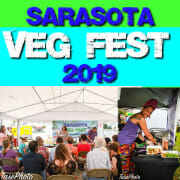 Sarasota Veg Fest will be at the Sarasota Fairgrounds on May 4th, 2019 from 10 AM to 5 PM. We are thrilled for the return of this event and hope you are too! We are seeking volunteers to help cover various roles throughout the day, including set up and take down, food sampling, assisting with children activities, educating the public, assisting chefs, photography, welcoming visitors, etc. Volunteers are essential to coordinating a successful event--we hope you are able to join us to make this event possible! If you don't see a position you are interested in and have an idea for how you can help, please contact Jenna Bardroff at jenna@sarasotavegfest.org. Some roles require volunteers to be vegan, such as food sampling or vegan ambassador.